The first thing you need on drizzly days is a good mac. For little Miss I picked out this fab Neon Candy Pink Showerproof Coat - it's a great colour and would look lovely with contrasting bright accessories. Wiss is a little harder to please at the moment as he's decided he doesn't like coats ("I can't run fast in them...") Even though it's been so cold it's all I can do to persuade him to wear a body warmer, but this Shark Waterproof Pack Away Jacket would be ideal to take out with us. Small enough to fold away in a pocket and thin enough to not interfere with his speed! While I was looking, I couldn't help but notice these other gorgeous items from Joules. I normally don't choose to dress little Miss in much pink, but I love it as a pop of colour especially with navy or grey. This Pink Cat Jersey Top is really fun, and the coordinating Grey Marl Cat Trousers look really comfy. And I couldn't resist the Bunny and Chick socks; with Easter round the corner these would make a lovely chocolate-free gift idea. These two jumpers caught my eye for Wiss: the Grey/Orange Marl Crew Neck Sweatshirt has a waffle texture which means it will be hard wearing and warm (especially if you don't like coats!) and the Slub Jersey Hooded Sweatshirt is lightweight enough to go over other layers and not slow anyone down! 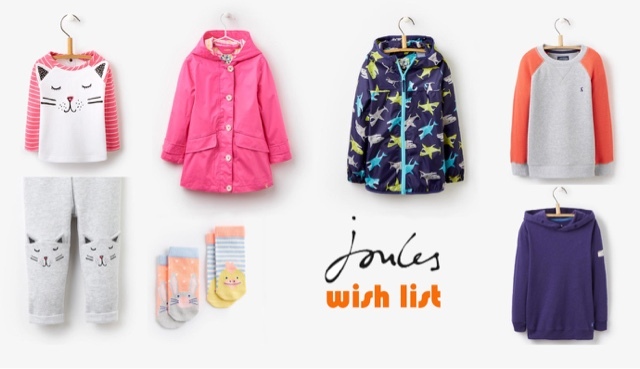 Check out the Right As Rain collection from Joules for loads of stylish and practical clothing for all the family (I'm eyeing up the gorgeous Seaford Mac for myself.) Bright colours mean those inevitable grey, wet days wont seem quite so bad!